Considered one of the greatest World Series games of all time, the epic 11-inning battle between St. Louis and Texas was an emotional rollercoaster that included just about everything you might expect to see take place on a baseball field. With 12 walks and five errors, it wasn’t the prettiest game ever played, but the abundance of dramatic moments and unbelievable ending elevated the back-and-forth contest into elite status. Down 3-2 in the series, the Cardinals needed a home victory at Busch Stadium to force a seventh and deciding game. It wasn’t looking good heading into the bottom of the ninth inning. St. Louis was trailing 7-5 and down to its last strike with two runners on base and third baseman David Freese at the plate. This moment in Freese’s career was certainly a time for calm. As Rangers fans prepared to celebrate, he sent the next pitch over Nelson Cruz’s head and off the right field wall for a two-RBI triple. 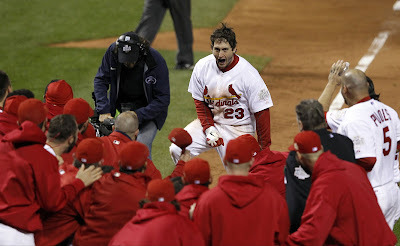 Freese then stood stone-faced on third base, perhaps a little shocked at his own heroics. The fact that he was even in that position served as a testament to a life-changing decision he had made nearly two years earlier. After nearly blowing his dream of playing in the big leagues due to some poor personal choices, Freese became a Christian and found help from spiritual mentors such as team manager Mike Matheny and teammate Matt Holliday. That’s when Psalm 23 became his favorite verse—something he would often read when he was having a bad day or about to approach a stressful situation. Such an opportunity came up again later in Game 6. It was the bottom of the 11th inning. St. Louis and Texas had traded more shots an inning earlier to bring the score to 9-9. When Freese walked to the plate for the sixth time, he now faced Rangers reliever Mark Lowe with no outs and no runners on base. With a full count, Freese took a fastball down the middle and powered it over the centerfield wall. The Cardinals survived elimination in thrilling fashion and went on to win the World Series with a 6-2 victory the following night. Freese fully understands that his life isn’t defined by what happened that night in St. Louis, but he also embraces the strength and peace that he received from the words of the psalmist—for big moments like the World Series and every other situation he might face. Dear Lord, we thank You for the comforting words that You have given to us in Psalm 23. Thank You for the peace and strength You give. In the Name of Jesus, Amen.